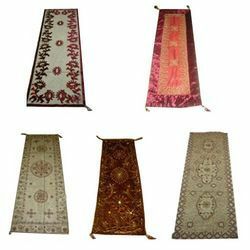 We are offering a wide range of Table Cover, Runners and Mats that is available in a host of eye catching patterns and colors. These are widely appreciated by our clients for durability and easy maintenance. Economically priced, these can also be tailor-made as per the specific demands of our clients. Our clients can avail from us a wide assortment of Table Cover that is crafted by our experienced designers to meet the latest market trends. These are available in various prints, designs, shapes and sizes to meet the various expectations of our clients. Further, our range can be customized in terms of size, color and material. We are manufacturing an enticing range of Table Mats that is designed using quality tested fabric to provide durability and strength for daily usage. 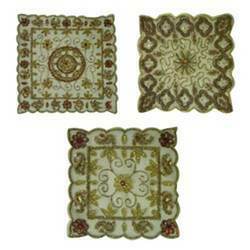 These are available in different shapes and sizes and are perfect for dining tables. Moreover, we specialize in customizing these table mats in accordance with the customer's taste. We are offering an exclusive collection of Table Runners that is widely demanded in hotels, restaurants, canteens and homes. 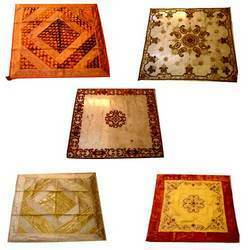 Crafted from quality fabric, these are used for enhancing the look of the table. Our designers hold expertise to deliver these runners in a host of mesmerizing colors and patterns. These runners can also be customized to meet the tastes and preferences of our clients. Nett table cover,table runners, table mats, with heavy hand-embroidered bead work done by best artisans with different kind of beads in multi colors.we have many designs and it is also possible to make in your sizes as per your orders.